Before I get into the random photos portion of this blog entry, I must note that today is the first day of school for my offspring. I’m ecstatic; they’re not. I need to pause to celebrate. 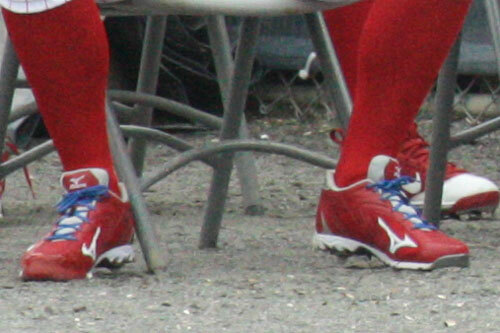 Baseball and hot dogs – a classic, timeless combination. An army of Diggitys stands ready for battle in the Lehigh Valley IronPigs clubhouse store. My daughter had to buy it, and she calls it “Rocky Celwinkle”. Since both Rocky and Mr. Celery are ostensibly male, I’m not sure how this would actually occur. 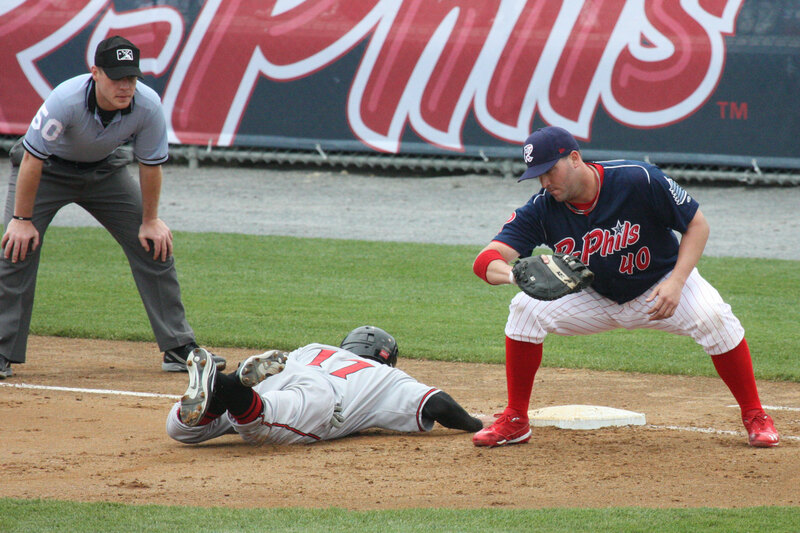 In Reading Phillies game action, this Trenton Thunder baserunner is out at first by a step, as R-Phils first-baseman Matt Rizzotti makes the play. 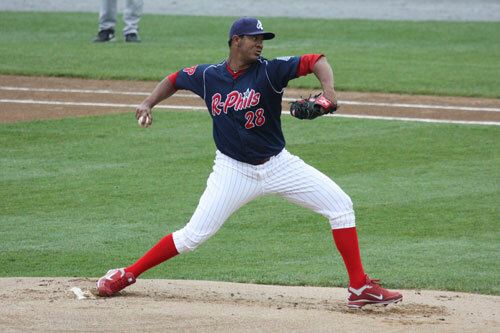 Rizzotti finished up the season at triple-A Lehigh Valley. “My ball is bigger than yours!” Members of the Wilmington Blue Rocks bullpen seem to be comparing sizes. This photo just screams out for some sort of suggestive caption. Send me your best – if it makes me laugh I’ll put it in my next entry. Cole Hamels has been pitching really well lately, though you wouldn’t know it from his 9-10 record. In July, I took my daughter to the last game before the All-Star break, and saw Cole get a 1-0 victory over the Reds. Attack of the 50-foot Phanatic!! Rocky Bluewinkle makes sure that home plate is sparkling white, though I’m not sure if it’s minty fresh. After a head-first slide into third with a triple, Blue Rocks infielder Rey Navarro needs to make a few, um, adjustments. Most of my summer baseball viewing was spent not on the Phillies or any other professional team, but on my son’s team. This was the first year he tried out for a summer team, and let’s just say it’s quite a time commitment. After a brief respite during August, it’s back to baseball as he has decided to play fall ball and forego football this year. Which is OK with me. I was very negligent in my blogging this summer. Sure, I was busy with a lot of non-baseball things, but I’m sure the rest of you were, too. So I don’t really have a good explanation. Nonetheless, I’ll try to post a few recaps of what I’ve been up to, in no particular chronological order. Earlier this month, my children talked us into going to the August 3rd Reading Phillies game in an attempt to get the most highly anticipated giveaway of the summer – the Ryan Howard Garden Gnome. Note that the gnome is for the first 2,500 adults. So even though my children wouldn’t be receiving gnomes, (hypothetically) Mom and Dad would each get one. A close look at the game listing reveals several issues that would end up conspiring against this plan. 1. The change in time of the game and gate openings. Normally, a weeknight game would start an hour later, with gate openings an hour later than listed here. Since my husband has an actual job, we were limited in how early we could get to the ballpark. 2. Unknown numbers of senior citizens would be entering the stadium at 4 pm for a pre-game Q&A, presumably receiving gnomes in the process. 3. Happy Hour and a pre-game concert were going on in the Classic Cafe, which opens an hour before the main gate. Due to my husband’s aforementioned job, the best we could do was to arrive shortly before the main gate opened at 5 pm. Considering my previous experience with the Webkinz giveaway, I figured this should be fine. The Webkinz hadn’t been hyped out the wazoo by ESPN and MiLB.com. We arrived about 10 minutes before 5, only to be greeted by a line that stretched from the main gate behind home plate, all the way down the street and past the left field corner. This did not look good for our gnome chances. While my husband and kids kept our spot in line, I strolled up toward the gate to check on the status of things, and to see if by chance there was a different line for those with e-tickets (which we had), rather than physical tickets (which it seemed like most other people had). At this time I learned from one of the stadium personnel that all the gnomes were already gone!! How was this possible? Look back at numbers 2 and 3 above. I doubt there were 2,500 senior citizens inside, but there were apparently a lot of people who came early to drink and get gnomes, and then left before the game even started! We started to notice numerous gnome-carrying people heading back to their cars. As we shuffled forward toward the gate, which had now opened, I spotted two slow-moving women walking towards their car, carrying gnomes. For the briefest of moments, I fantasized about knocking them down and running away with the gnomes, but there were way too many potential witnesses waiting in line with us. Gnomeless, we went inside, got something to eat, and waited for the first game to start. Due to the fact that it was only a seven-inning game, between-inning events occurred earlier than they normally would. The Crazy Hot Dog Vendor ran out after the first inning, and suffered a slight malfunction during his routine, leading to a stray dog incident. My son and I were watching throughout the game to see if anyone would step on it before it was picked up. This Trenton Thunder batter came closest of anyone during the first game, but the dog made it through seven innings unscathed. 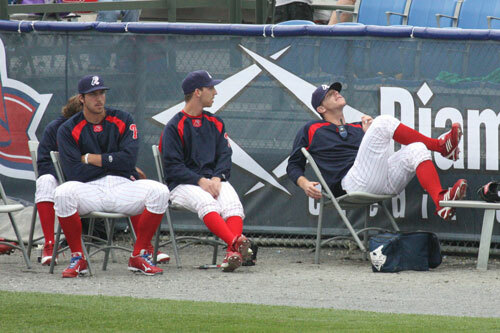 R-Phils first baseman Matt Rizzotti seems to be impersonating Sandy Cheeks, or for the older generation, Rocky the Squirrel. Not to be picking on Matt, but later in the game he looked like he took a wrong-way swing, though he was just getting out of the way of an inside pitch. 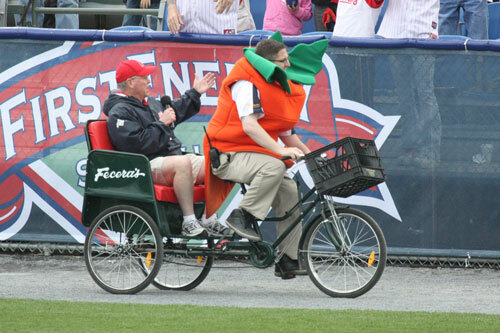 The R-Phils staged a dramatic bottom-of-the-seventh comeback to win game 1, 6-5. We never did see if the stray dog lasted through the second game, because we ended up leaving after the first game. There was a half-hour break between games, and both kids and my husband were ready to leave. I wasn’t, but I was outnumbered. Guess I’ll have to look for gnomes on eBay. Quite a few have been sold already, with the highest one so far going for $81. I’m not about to spend that much on a gnome, even if it does (sort of) look like Ryan Howard. Maybe by next year the price will come down.